The lightweight and powerful Behringer Eurolive B112D active PA speaker delivers excellent, low-distortion power and state-of-the-art features. Whether you're addressing a small meeting or jamming at a coffee house, the B112D delivers the clean, in-your-face vocals, and rich bass you need to get the job done. You also get high-end features such as a 2-band EQ, active crossover, dual protection limiters, and transducer response correction ensuring that your audience experiences top-notch sound quality. Also, thanks to its switched-mode power supply, the Behringer Eurolive B112D active PA speaker is light enough to nix the roadie and is able to run cool for hours without breaking a sweat! 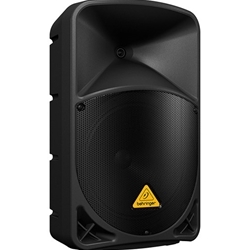 The Behringer Eurolive B112D active PA speaker's LF and HF transducers are designed specifically for each application, ensuring a flawless performance. You can expect massive quantities of low end, with articulate, detailed mids and crystal-clear highs every time you power up the B112D. Toss its 2-band EQ, integrated sound processor, and large-format exponential horn into the mix, and you can be assured that your audience will experience exceptional sound quality in every corner of the room.